Call me psychic, but I think they're trying to give all the awards to 12 Years a Slave this year. The drama has just earned another 7 nominations--including a best director nod for Steve MCQueen--this morning, this time from the Hollywood Foreign Press Association's Golden Globe Awards. The film is up against some stuff competition with the likes of Gravity and Captain Phillips (two of my personal favorites this year). As usual, all eyes are focused on the comedy/musical category, a hodgepodge of films with varying degrees of humor and music (though, if anything, I think American Hustle is the most comical of those I've seen). Director David O'Russell, clearly an awards magnet, is just one nominations for the film (the entire main cast--sans Jeremy Renner-- is nominated as well). But, between you and me, I preferred Christian Bale in Out of the Furnace (a movie I otherwise didn't really like) over his performance in American Hustle? Other than that, everything else seems on par with the other awards this season. But I'd like to also say that I found Julie Delpy's character in Before Midnight at her most aggravation (though I did like her in that one wine table scene), and I wasn't really over the moon for Greta Garwig in Frances Ha. And, while I'm thrilled for Julia Louis Dreyfuss' nomination for Enough Said, I'm sad to see James Gandolfini didn't receive a nod (but I see Bradley Cooper snuck in this category--a pleasant surprise). Also surprising? Chiwetel Ejiofor's second nomination (he's also recognized for 12 Years a Slave) for the TV film, Dancing on the Edge, which I have never even heard of (netflix-ing it now). 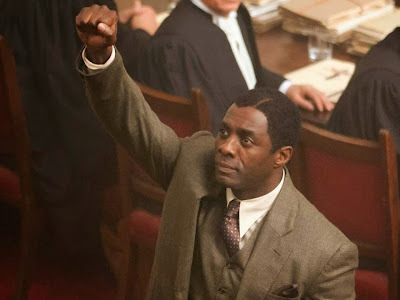 I'm also a bit surprised by Idris Elba's nomination for Mandela: Long Walk to Freedom. I had issues with his performance (but happy to see him nominated for Luther), but Naomie Harris gets shut out? I frown at that. And speaking of scoffing, The Croods is absolutely terrible--no way does it deserve to be recognized here (could have been replaced by Monsters University). But the foreign film nods for The Wind Rises and The Hunt? Now that I can get behind. Lastly, I think Colin Farrell is the best part of Saving Mr. Banks--and he is not even nominated. Chiwetel Ejifor - "12 Years A Slave"
Greta Gerwig - "Francis Ha"
Atlas - "The Hunger Games: Catching Fire"
Let It go - "Frozen"
Ordinary Love - "Mandela: Long Walk to Freedom"
Please Mr. Kennedy - "Inside Llewyn Davis"
Sweeter than Fiction - "One Chance"
The Golden Globes will be broadcast live on January 12th at 5 PM PST/8 PM EST on NBC.